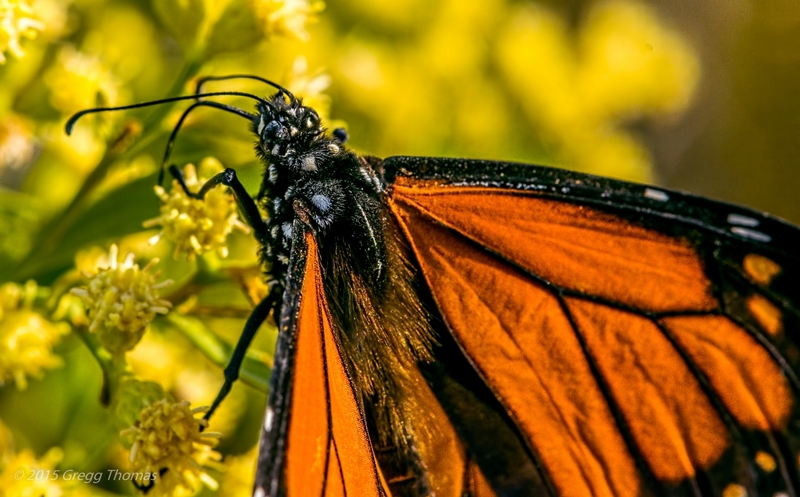 The Monarch Butterfly. We’ve known about them during our entire lives. I’m almost embarrassed to say that before I really got into photography, they passed me by… literally. Sure, I’d admire them, and they’re gorgeous to look at, but I never had the chance to get really up close and personal. I’ve always loved the outdoors, being raised by parents who very much appreciated nature and being outside. However, around a year and a half ago, I decided to get serious about photography. It was one of those, “Go big, or go home” sort of decisions in my life. After having decided to shoot in manual mode, from that decision point forward, I began to spend a lot of time outdoors with my camera. A lot of time, actually, considering I have a day job and two daughters. Looking back, that decision opened my eyes, because I began to see things everywhere around me that I hadn’t before. I tried to develop a heightened sense of awareness, examine everything around me, and an eye for light. Thus far, this has led me through a journey which includes the satisfying realization of just how blessed I am to live on the Emerald Coast of Florida. And one of the things that I have come to absolutely cherish is the Monarch migration. Here in Okaloosa County, Florida, in the western panhandle of Florida, we’re in the migration path of the Eastern Monarchs. In fact, this past year I found myself impatient for the fall weather to arrive. And then the butterflies began to appear here and there. 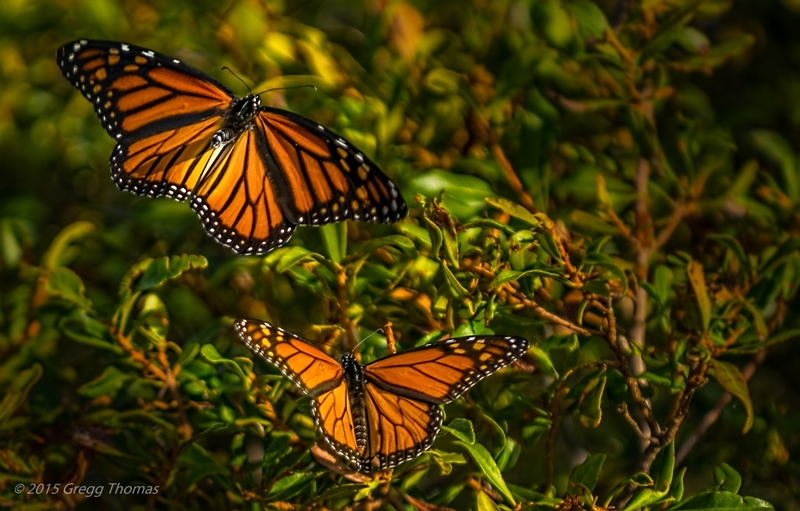 Here in the panhandle, Monarchs can be photographed mostly in September, but with photography, you just never know. 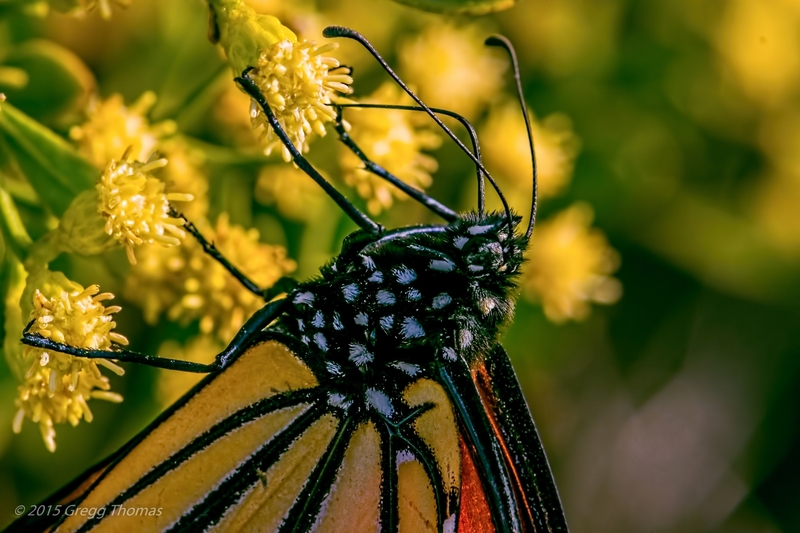 Midway through October, I was surprised to see a large number of Monarchs right on the beach, taking the time to feast on bushes flowering with bursts of bright yellow flowers. This day turned out to be quite different from others in that I was able to get as close as I wanted. In my mind, I worked out logic that they must be tired and famished… who really knows? With their indifference to how close I approached, I decided to deliberately shoot with my macro lens and later with a super wide angle lens to capture shots I had never yet tried, much less accomplished. This resulted in some extremely tight close ups of these regal bright orange travelers, as well as some interesting wide angle shots. Macro shots almost always are like opening a present without knowing what’s inside. The detail one can capture is simply beyond the ability of the naked eye, and the Monarchs are just fabulous. I had some fantastic models on this sunny October day! 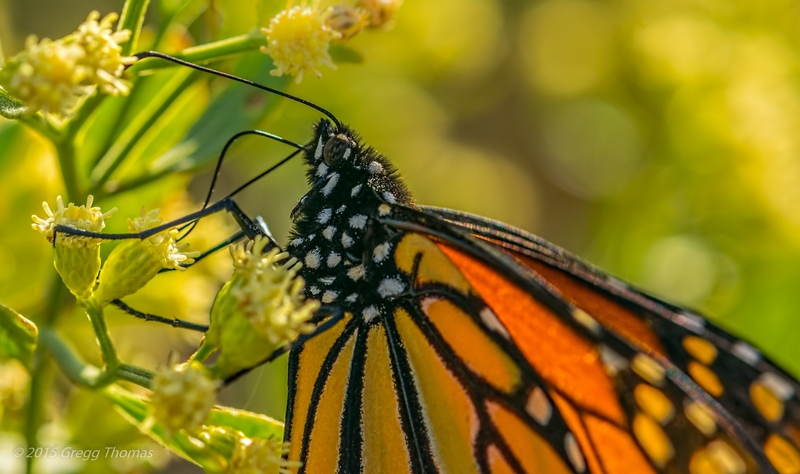 When I shoot monarchs, I typically set my camera up for f16 in order to assure a good depth of field, a shutter speed of 1/2000th, in order to get the moment frozen, and then adjust the ISO as needed, typically to something like 200 or 400, depending on the day’s sun. In this case, I was trying to get extreme close-ups, detail not seen with my eyes. 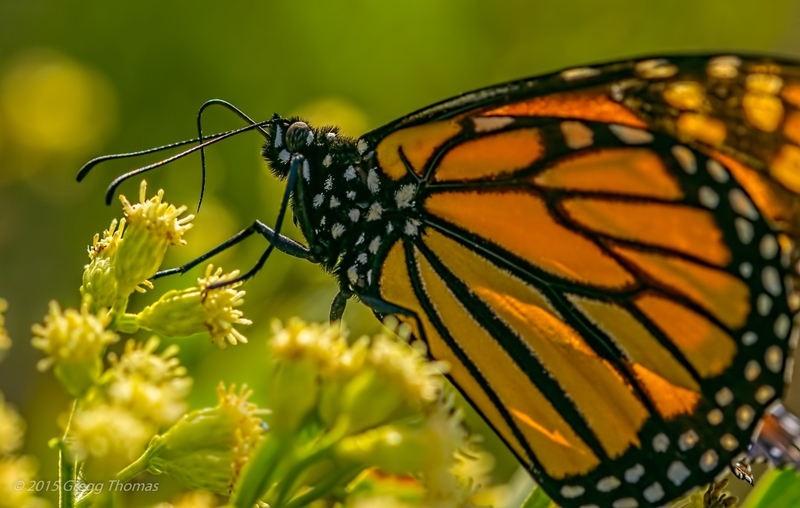 The super wide angle also allowed me the ability to get the monarchs on the bushes, “in situ” with their food sources. It will never cease to amaze me how Monarchs navigate, given that it takes four generations to make the migration journey through its full cycle. What a day. I’ve never had an opportunity as I had on this day, and not one since, but that’s why I explore. That’s why I look forward to tomorrow. Beautiful photos of beautiful creatures! Thank you for sharing these beautiful photographs from your home- keep shooting! Nice pictures. What a beautiful colors.